Simmons encouraged teachers to cultivate their own emotional intelligence, which is defined as the ability to monitor one’s own and others’ feelings, to discriminate among those feelings, and to use this information to guide one’s thinking and actions. 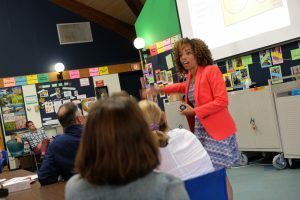 Simmons said that using emotional intelligence within the framework of being culturally responsive, or taking the time to learn about a student’s unique cultural background and experiences, help classroom leaders take into account that students start with baggage that may not be obvious or visible. This also gives teachers insights into the array of positive attributes that students may be shielding from view. See Dena Simmons’ TED talk here.